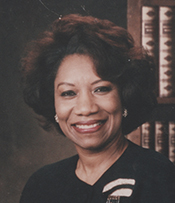 MILLENDER-McDONALD, Juanita, a Representative from California; born in Birmingham, Jefferson County, Ala., September 7, 1938; B.S., University of Redlands, Redlands, Calif., 1981; M.A., California State University, Los Angeles, Calif., 1988; attended University of Southern California, Los Angeles, Calif.; member of the Carson City, Calif., city council, 1990; mayor pro tempore, Carson City, Calif., 1991-1992; educator, Los Angeles Unified School District, Los Angeles, Calif.; delegate to the Democratic National Conventions, 1984, 1992, and 2000; member of the California state assembly, 1993-1996; elected as a Democrat to the One Hundred Fourth Congress by special election, to fill the vacancy caused by the resignation of United States Representative Walter R. Tucker III, and reelected to the six succeeding Congresses (March 26, 1996-April 21, 2007); chair, Committee on House Administration (One Hundred Tenth Congress); died on April 21, 2007, in Carson, Calif.
Juanita Millender-McDonald in Black Americans in Congress, 1870-2007. Prepared under the direction of the Committee on House Administration by the Office of History & Preservation, U. S. House of Representatives. Washington: Government Printing Office, 2008.